Funny thing about Indian versus Western approaches to yoga; Western women lean (pun pun pun) a lot towards the physical perks of practising asanas for toning the form, whereas (aside from the one example listed below), in India it’s all about the inner. Classes concentrate on health benefits for body parts and the spiritual steps, with weight loss or toning rarely mentioned (aside from my morning teacher; apparently tadasana is “good for your thigh fat, good for your calf fat”. Fantastic!). Eva and I had a good giggle over a mini manual Amrit has in his office. Featuring his mother, the booklet goes through poses declaring, “What is the beauty and health secret of fabulous models, ballet superstars, athletes reigning movie monarchs? 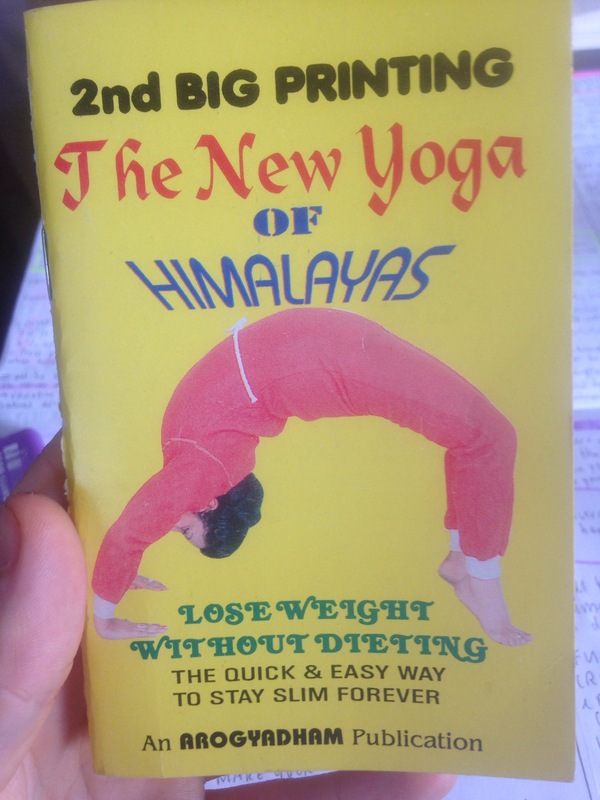 The answer is YOGA, the mysterious knowledge of body from the East that offers spiritual and physical beauty to all its devotees… Slim and trim the body down to a perfect shape and easily slide off extra inches without fancy machines and sweaty rubber exercise outfits.” (What on earth does she wear to work out in?). 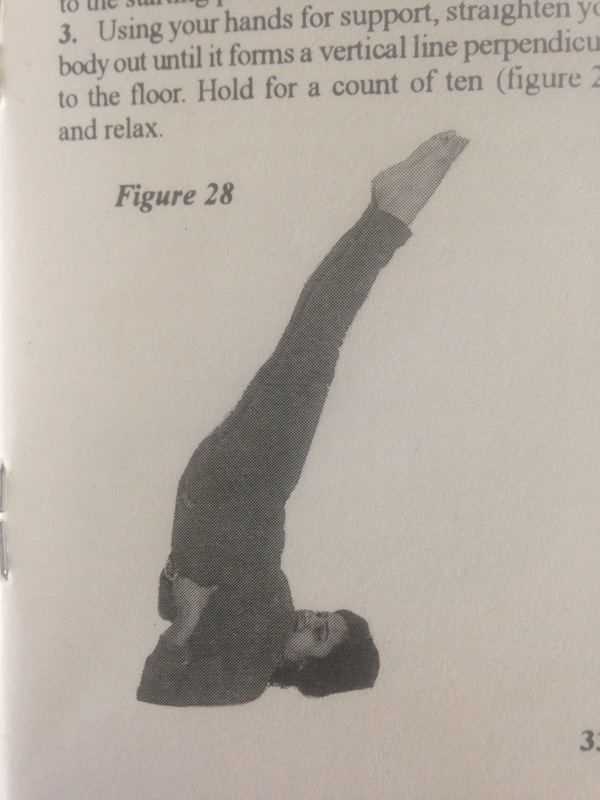 Mrs Raj is shown on each page poised in asanas claiming to put “pep in your step”. And the funny thing about all this? She is pretty plump. Chubbilly chunky. But in India, this is the ideal. Skinny shows poverty, whereas a bit of extra belly proclaims wealth and the propsensity to eat well. So “slim” is undoubtedly culture relative. 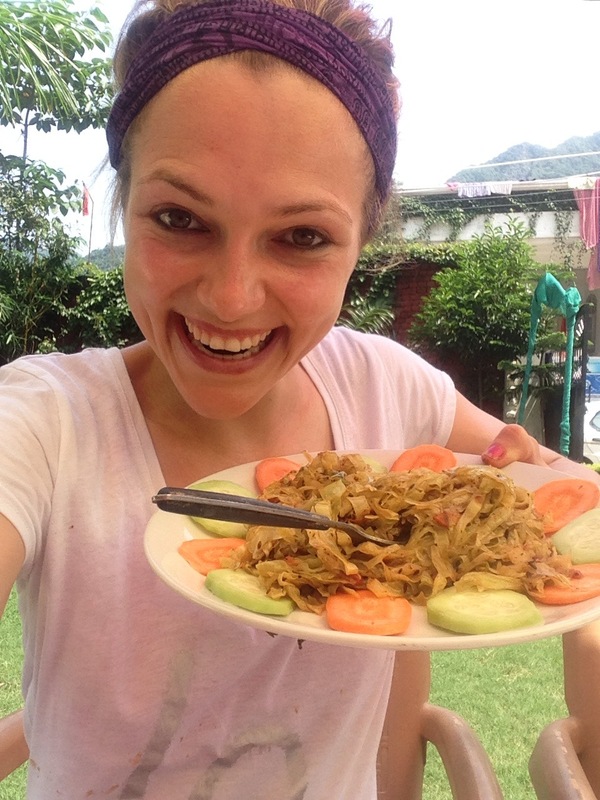 When we arrived at the ashram it was drilled into us about the importance of preparing and cooking meals with love. We were ensured Anil the cook put pure passion into every dish, with the energy transferred into the food and in turn ingested by us. At first I dismissed it as daft nonsense, but thinking about it, it sort of makes sense no? If prepped in hate or haste, that energy is going to transport into the tucker. Maybe it’s partially why I’m actually taking pleasure in eating here? Because each meal is prepared with love, rather than the tension and apprehension should I be behind the spatula? The thing is I don’t not like eating; in fact, I actually quite like it. The issue is that once I start I find it difficult to stop. So I don’t start. Or if I do, it’s from an eminently limited palette. At home before I left I got to the point I could only indulge in dinner if I was immersed in a book or engrossed in TV. It would take my mind off the act, and therefore temporarily the panic and guilt. But my hunger cues were so out of whack I couldn’t comprehend when I was full or hungry. Literally famine or feast. So I cut everything out my diet that could stack on an ounce; think meat, dairy, bread, etc. Vegetables became my favourite thing and I’d munch through ten carrots on the trot. Before I left there was one day I ate nothing but a good twenty tomatoes. But I find here, eating with complete consciousness and in company, I’m becoming aware of how much my body needs. I feel full. I recognise ravenous. One plateful is plenty. I remember reading somewhere once upon a time that those entrenched in ED’s clutches are emotionally stunted at the age he got a good grip. So that would make me at a mental age of about 14. Thinking about it, really pondering the premise, I can see a tad of truth. I fall back on my parents like a 14-year-old when I fall off the bandwagon. “Wobblies” sometimes befall me, I’ll admit. (Here I’ll share a rather reddening tale from a year or so ago: the Wortman clan were on route to Tauranga to see the g-parents, when an Adele song came onto Classic Hits. Old Pop had a minor – ok, massive – meltdown, as the melody unearthed memories of “feeling fat”. I’m ashamed to admit I cried and demanded the channel be changed. It is an event I would like to forget; unfortunately, Henio, Deb, Mikey and James beg to differ and bring it up rather regularly). 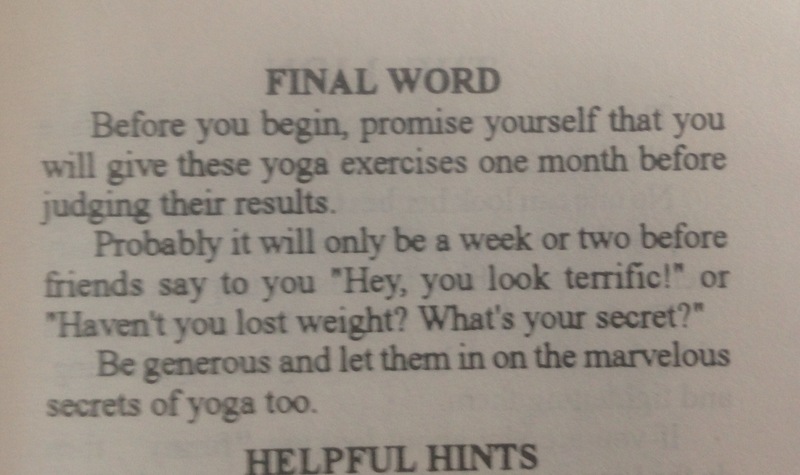 I won’t go all into the theory, but Hatha approaches yoga in attaining mental discipline through physical discipline. And it’s so the case; the necessity for me to hold an asana and focus on one thing is slowly giving me the ability to do so with my manic mind. I’ve never been one to sit still (unless I’m reading, then I can for hours on end), preferring running and such over “passive” Pilates or yoga. But having to hold positions has slowly started to ground me in both body and mind, and rendered me incapable of running away (physically and mentally). Of course, meditation still proves a tiresome task. I get so antsy and find myself clocking the time to count down until I can stop. But I think a big part of this is to do with age; I’m restless and just not ready – yet. But give it another wee while and some dedicated implementation and I have no doubts I’ll be all over it with my all-or-nothing mentality. I highly hope I’ve eradicated at least a portion of ED. He’s still there, sinisterly and slyly slipping in his two cents worth (well, more like twenty bucks). But I visualise in my mind a chunk of him turrenting in the Ganges’ currents, and I aim to offload a significant segment up at EBC. I want to land in NZ less weighed down than when I left (aside from my suitcase). Who knows? 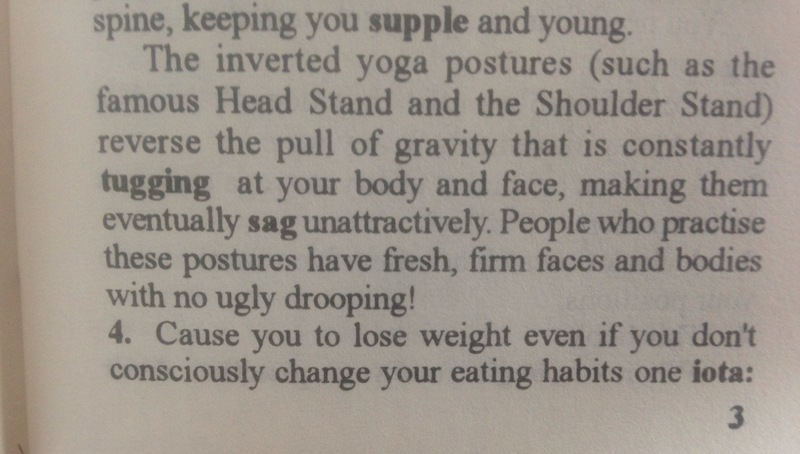 Maybe in ten years time Rajeesh and I will have our own mini manual with “Indian slim” Pop proclaiming how to achieve popstar posture.